Talk About Curing Autism (TACA) is a national charitable organization founded in 2000 that helps families living with autism navigate the many challenges they face. This year marks the 12th anniversary of its annual “Ante Up for Autism” casino and gala event, which will take place at the recently renovated Waterfront Beach Resort in Huntington Beach, California, on Sat., Oct. 27, 2018, at 6 p.m.
Autism now affects 1 in 59 children and adults, a dramatic increase from the 1970 rate of 1 in every 10,000 U.S. children. Talk About Curing Autism (TACA) is a national charitable organization founded in 2000 that helps families living with autism navigate the many challenges they face. 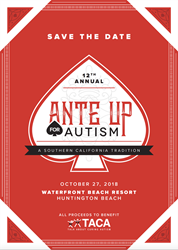 This year marks the 12th anniversary of its annual “Ante Up for Autism” casino and gala event, which will take place at the recently renovated Waterfront Beach Resort in Huntington Beach, California, on Sat., Oct. 27, 2018, at 6 p.m. The festivities will be hosted in the resort’s brand-new ballroom expansion, and overnight guests will be able to take advantage of the new $130 million remodeled guest tower. This year, title Co-Sponsors include Happy Families and Josh and Courtney Ungaro. Co-Presenting sponsors include Ira Hermann, CLU, ChFC, and Capstone Partners, Financial & Insurance Services, LLC. Guests, sponsors, celebrities and poker professionals will come together for a casino-themed fundraiser hosted by TACA. Join them for dinner, silent auctions and friendly poker games, all of which will raise money to provide Real Help Now for families affected by this prevalent and underfunded disease. All proceeds benefit TACA families. Almost 3 million people are living with autism in the U.S. Almost 200 children in the U.S. are diagnosed with autism every day. More children are diagnosed with autism each year than with AIDS, diabetes and cancer combined, yet the least amount of funding goes to researching this disease. TACA supports over 55,000 families, with 650 new families added every month — a dramatic increase from 350 per month the previous year. With early intervention and medical treatment unique to the individual’s needs, children with autism can make great progress and even recover from their diagnosis. Over the past 11 years Ante Up for Autism has raised more than $4 million. Funds raised from this event will provide critically needed resources for the rapidly growing number of families affected by autism. For more information on sponsorship or event tickets, please visit http://www.anteupforautism.com. Talk About Curing Autism is a national nonprofit 501(c)(3) organization dedicated to educating, empowering and supporting families affected by autism. TACA’s aim is to shorten the cycle time from autism suspicion to effective treatments, thereby creating the best future possible for individuals living with autism. TACA helps to strengthen the autism community by connecting families and professionals with valuable information to greatly improve the quality of life for people living with autism. For more information about TACA or to get involved, please visit http://www.tacanow.org.